Do you hear scurrying in your attic during the day or early morning? Does it sound like nuts rolling on the ceiling? If so you might have a squirrel problem. Here in SE Michigan squirrels are a common nuisance animal. They infest attics causing annoying scratching noises, insulation damage and possibly fire hazards. 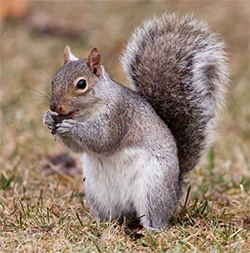 There are several types of squirrels in SE Michigan, but the most common nuisance squirrels are the Fox squirrel, Red Squirrel and the ever elusive Flying squirrel. Each type of squirrel presents its own unique challenges for control. It takes an experienced and skilled professional to effectively solve a squirrel problem. Fox Squirrels are brown to reddish brown squirrels with a large bushy tail. They weigh about 1 oz. to 1.75 ounces and can measure about 18 to 27 inches from nose to tail. They occupy attics during the spring baby season and during the fall to store food and escape the cold. 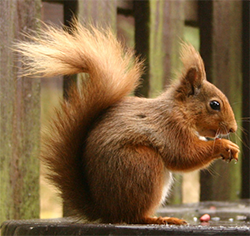 Red Squirrels are the most common and active of the nuisance squirrels. They are active in the morning, during the day and in the evening after dusk. They are smaller than the Fox squirrel usually weighing about 1/3 to 2/3 of an ounce. They have a red back with white fur on the belly. They store large amounts of food like walnuts, pine cones and acorns in attics and crawl spaces. They breed twice a year in the spring and fall producing 3 to 6 babies per litter. Flying Squirrels are much rarer than the other nuisance squirrels in SE Michigan. But they present a unique challenge due to the fact that they live in colonies and are nocturnal (active at night). Flying squirrels are small, weighing less than an ounce with grey fur and large black eyes. They are only about 3 to 5 inches long and can squeeze through very small openings to enter attics. Inexperienced persons may mistake a flying squirrel problem for mice or some other nuisance animal. Farmington Hills, Hamburg, Hartland, Highland, Howell, Milford, New Hudson, Northville, Novi, Pinckney, Plymouth, Salem, South Lyon, Walled Lake, West Bloomfield, White Lake, Whitmore Lake, Wixom, Wolverine Lake and surrounding areas. Call (248) 676-8800 for an appointment or e-mail Animal Pro at info@animalproinc.com.